Even though, my website Chill Geeks is now hosted as a WordPress blog, but I would still prefer blogger/ blogspot over WordPress and I’ve my reasons for that, blogger is something which is designed from the view of blogging purposes. It provides most of the required customization options, analytics and theme designing as required for a blogging platform. With all new version of blogger, they’ve also added a lot of other things which made blogging even more easy than ever, and of course the new pre-built views (viz. Flipcard, Classic, Magazine, Mosaic, Sidebar, Snapshot, Timeline) make the layout and designing a hassle free job, plus the coding is so done, you don’t have to worry about any error or warning regarding validation of HTML/CSS/XHTML. Coding is so clean and optimized for Blogger Blog, but in wordpress it seems like there is a lot of clutter which is not required if you are good at basic HTML and CSS. Clean coding helps in better SEO as it will be easy to understand for Search Engine Spiders. As the Google account is associated with a blogger account, its sign in is done using SSL only. However, if you own a WordPress blog, you’ll have to purchase SSL certificate to enable SSL login in WordPress blog. Unlike wordpress Blogger works with only one XML file and all pages are generated using that XML file only. WordPress uses php and you’ll have to make a diffrent php for header, footer, body content, sidebar of blog. Which also causes increased page loading time. Apart from custom file hosting, any thing can be done on a blogger blog, which a wordpress blog can do. But, In the end, WordPress is having its own advantages, scripts like timthumb can be used at WordPress only which is helpful in generating optimized code for thumbnails view. For blogging, I would always prefer Blogger over WordPress. But for doing more than blogging, WordPress is good. I am always fascinated about going to Daryaganj, after all you got to see a hell lot of books, in Sunday book market of Daryaganj, but this time, my visit was a depressing one, partially because of me only.. I was at my friends’ Mayank’s home this weekend, in Gurgaon, woke up late on sunday morning, and it takes 2 hours to reach from Gugaon, sector 15 to Delhi Gate, Daryaganj. So, anyhow, we managed to reach there at 12 noon. This is really not a good time to visit Daryaganj, especially in summers, it was too hot to browse for books in open market, I was surprised to see, foreign tourist enjoying this kind of shopping. 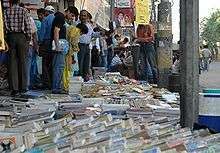 I would recommend you to reach Darayganj by 9 am, vendors get seated over there at that time, crowd is also less, and you can easily get your favorite book at that time, without roaming around much under the bright sun. Academic books are available over there, but you won’t buy them coz most of them are very old editions and obsolete, and those academic books are also not much of a bargain over there. Do carry a bag with you if you are thinking of a lot of book hunting. Prepare a list of books, before heading over, as this will help you to be focused on particular books, otherwise, its like sea of books over there. A water bottle is essential for every travel in summers. Do take it, don’t forget it. By the way you can easily reach Daryaganj from your place by De-boarding at Pragati Maidan station, and taking a DTC bus for Delhi gate, 429 number bus has very rapid service from there. with the best services, the best network provider in India, and every vodafone customer seemed to be so happy. I was a Tata Docomo customer at that point of time, and even I used to be very happy and satisfied customer of Tata Docomo, they provided me with the best suitable mobile plans for me, and they’ve got good network coverage, all the places I traveled through, like Lucknow, New Delhi, Haryana, etc… In just 200 rupees I was able to manage my monthly mobile calls/SMS/GPRS expenses, very easily with optimum calling rate of an avrage of 5-10 minutes per day (outgoing). It took me 5 visits to retailer, 4 E-mails to Vodafone customer care, more than 7 calls to Vodafone care Delhi (not Toll free) and 15 days in total to get my SIM activated, after purchase and submitting of all the documents. Well.., people so over hyped vodafone services in my mind so, I could get that strength to bear those 15 days on roaming. Well, after successful activation of services, I just looked at Top Ups, Validity and various special tariff recharge vouchers available for Delhi NCR region, I found it very costly. But price is not a big deal for me, if I get good services at higher price, I am ready to spend accordingly. So, I did spend about 100 rupees on Message pack, 100 more on GPRS pack, and 150 for Talk time, on the day of activation itself. Now here starts the heights of fraud of big mobile network provider, I got the message for my respective recharges immideatly after the recharge, and I started messaging happily, but then after some time I realized that the GPRS browsing which I was doing was deducting from my main account, and when I called them for a reason, they said it takes 4 hours to activate GPRS plan, however message pack activates immediately, and any amount deducted from main account can not be refunded, and that jerk, sitting at Vodafone customer care hung up on me. The company just hire idiots to sit over there who don’t know how to talk to their customers. And.. I forgot to tell, Vodafone Care is also not toll free, you have to pay them out of your main account balance, to get your problem resolved which is caused by them only. This is one of the biggest flaw in after sale services of any product. I don’t think, any mobile operator charges for there customer care service number calling. Well, in this way, I lost most of my main account balance from my prepaid SIM, in few days of purchase of new SIM. In the end…, network reach of vodafone is also not so good, I’ve experienced a lot of problems of network while traveling though Delhi, especially in Metro, underground, as well as overground.